I woke early around 2 am and i am just twisting and turning. Probably keeping others in this 4 bed dormitory room awake, so I grab my things and head to the kitchen. My plan is to leave by 5:15 am but I have to send some emails to reserve some accommodations in Italy first. I type a common message and personalize each with the correct location and the night of the stay. Then it's foot management time. I take care of my feet. Bandaging raw areas or wounds. Vaseline in between the toes. Lastly put on the shoes. I am almost ready to go when I hear rainfall then crackle and boom - thunder. I pick up my backpack and I am out the Gite door and heading down some stairs. It's still dark at 5:15 am. I start walking going from the urban town of Navarrenx, to the suburbs then to the more rural areas and the Chemin (path) then going into the forest. I haven't seen a soul yet. It's 6:15 am and the sun rises at 6:30am. I head into the forest. I feel really relaxed. I am at ease this morning. At peace. Unusually so. I keep walking, still not a soul in a sight. Instead, my senses are absorbing all the sights, sounds and smells. It's amazing. I am hearing sounds individually. Like the the little bug that buzzs by my ear. Or the stream that's gurgling on the side of the road. Or the leaves of the Aspen trembling in the wind. I'm lost in the moment I really don't know how long it lasts but it seems like 30 minutes. It's a beautiful 30 minutes absorbing the environment around me. but I feel really fresh like I haven't walked at all. I cross a bridge and there's a beautiful stream with crystal-clear water. Usually all the streams have brown or green water. This stream is spectacularly clear. It just looks too good to pass up. I cross the bridge and find a way down and there's a car parked there. As I approach the stream I see a man flyfishing. I ask him if it's OK if I get in the water here. He motions that it is OK. 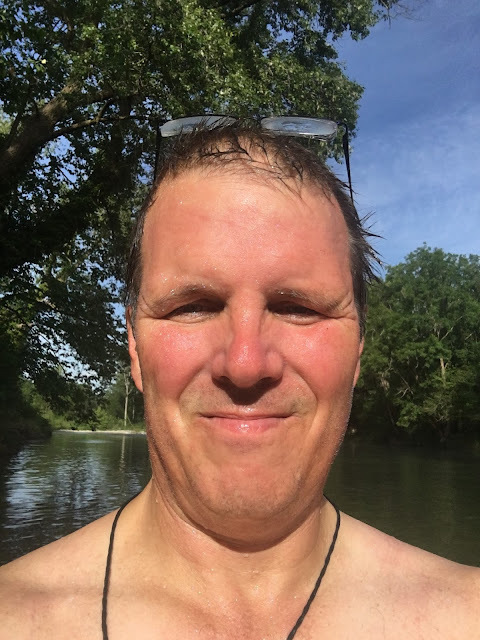 I wade into the stream but it is bone chilling cold. It feels like it should be ice. I wouldn't call it swimming but I dive into the water. Now I'm cold it is time to get out of the water. That was super refreshing. I head to Aroue looking for the gîte Escargot. When I arrive there are a number of Gîtes. Seems like each one has altered the Camino signage to direct all pilgrims by their Gite. After walking all over the town, I stop by the only Gite on the main drag. I meet the owner, Phillip and he says the Escargot Gîte is 15 kilometers away. At that time I had no idea the Gite I was standing in was the right Gite. And Gite Escargot was tomorrow’s Gîte. I probally had close to 25 km of walking already done. Another 15 would be ok. My legs felt good and my knees were behaving well. The next two hours of walking went by a number of houses with some big dogs with big teeth that acted like I was trespassing by walking in the middle of the road. I keep my eyes open for a nice stick. About this time, I run into Stefan from Bavaria with Rastafarian hair. 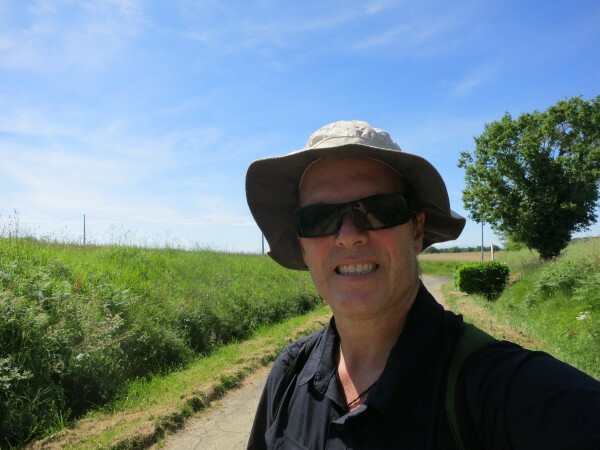 Stefan Is a kindergarten counselor on sabbatical walking to Santiago. His hair helps him stand out as I had seen In Navarrenx the night before. We both have no water. I knock on the first door and the lady is kind and refills our bottles. Stefan and I walk another 1000 meters then we go our separate ways. I rest and take Parkinson's medicine then proceed to the Gite Escargot. Amazingly, I still have energy and my knees feel great. I see the sign for the Gite Recargot and it points straight up a hill. Slow and steady up the hill I go. At the top the road turns into farm road. There's a house and a second building that may be a Gite but it's pretty run down, I sit down and eat the remaining half of the chocolate bar which had melted. I lick the remaining chocolate from the tin foil. There are two clear options. go back to Aroue which is 15+ kilometers or go forward 5-15 kilometers. I hate going backwards, so i hoist up the backpack once again and start walking. I walk through two villages but no Gîtes. Next stop Ostabat. It's another 10-15 kilometers. I cross a stream and the path turns into a single track path climbing the mountain. After a few kilometers the path merges into a rural street and goes through a small community. The street ends into a gravel road that goes straight up the mountain. Steep vertical pitch and not a soul in sight. I keep reminding myself that you'll get there just put one foot in front of another and i’ll get to the top. There's some signs but they refer to native plantings. No trail signs. In the distance is a small structure with some benches. I head that way. It's the chapelle de Soyarza at the top of the mountain. I like this type of chapel - small and in an incredible natural setting. I am very dehydrated, fortunately there's a small waterline. I fill the water bottle then drink the whole thing then fill the bottle. I pass the chapel and I am happy to be descending. Time to get off this mountain! The gravel path ends at Saint Nicholas chapel. And restarts on the other side of the chapel. Amazingly it's actually goes up for a couple of kilometers. Really? I am feeling pretty good but worried that Clive and Maya may be worriedsince I was suppose to be In Aroue 6-7 hours ago. I finally see the small town of Ostabat. As I enter the town, two medium size dogs bark and show their Big Teeth. I have seen lots of big dogs today but these two take the cake for trying to bite me. I see Marie and she's heading for dinner and recommends trying the next Gite since hers is full. The next Gite is serving dinner and they are on the first course of Basque soup. There's two seats left for dinner. They offer to talk to their neighbor about sleeping in their basement. I eat dinner talking to two French women , two Australians and a couple from the Alsace. I log onto the gite’s wifi and let Clive and Maya know that I am ok. The end of walking all day with few breaks. My best day of walking ever and my knees feel terrific. 56.8 km, 75368 steps and 3,560 feet. A perfect ending to an awesome walking route.